Henry Holt and Co. (BYR), 9780805095142, 304pp. Sam has the rules of slackerhood down: Don't be late to class. Don't ever look the teacher in the eye. Develop your blank stare. Since his mom left, he has become an expert in the art of slacking, especially since no one at his new school gets his intense passion for the music of the Pacific Northwest—Nirvana, Hole, Sleater-Kinney. Then his English teacher begins a slam poetry unit and Sam gets paired up with the daunting, scarred, clearly-a-gang-member Luis, who happens to sit next to him in every one of his classes. Slacking is no longer an option—Luis will destroy him. 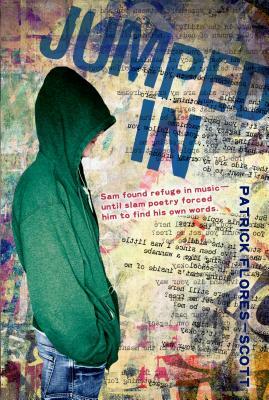 Told in Sam's raw voice and interspersed with vivid poems, Jumped In by Patrick Flores-Scott is a stunning debut novel about differences, friendship, loss, and the power of words.